I love going to live theater. The Ranting Wife and I have had annual theater subscriptions here in Cleveland (which has the largest theater district in the United States outside of New York) for 10+ years. I go to professional theater, community theater and even shows put on by casts at local Universities and High Schools. I’ve had a few unique theater experiences from Murder Mystery dinners to seeing the 8 1/2 hour-long The Life and Adventures of Nicholas Nickleby. By far, though, the most unique experience was Tamara. Tamara is a theater experience that started in Toronto and later moved to Los Angeles and then Broadway. I saw Tamara in Los Angeles (twice). Housed in the old American Legion Hall (which looked quite a bit like an Italian villa), you enter into a lavishly decorated building. Tickets are taken and passports to Italy are given. The audience members are ushered into a large interior covered courtyard that has a number of doors leading from it. Up above, there are several balconies looking down on the courtyard. The door that everyone entered through is closed and a character emerges on the balcony. Soon several characters enter into the room where the audience is and a small scene begins. At some point a character exits, leaving the door open behind them. Here is where Tamara is really unique. Some audience members follow the character out the door. Other stay and when additional characters leave, they are followed too. Throughout the house scenes take place with a dozen or more audience members standing to the side observing. As new characters enter, they bring an entourage with them. You are allowed to follow any character at any time. You can switch characters at whim. You cannot wander around (you must be following a character) or open a closed door (some characters close the door behind them). So at any given performance, you only see a small subset of the scenes occurring. The story is interesting, but the experience is the real draw. Like Downton Abby, there are “upstairs” characters and “downstairs” characters. One of the times I went, I was in the kitchen (in the basement) when a bell rang. The maid character sprinted out the door. I followed her up two flights of steps into a dining room where she was given a platter where she immediately turned around and took it back down to the kitchen. Through careful timing and planned interactions, all audience members end up in the kitchen for an intermission and back in the courtyard at the very end of the show. 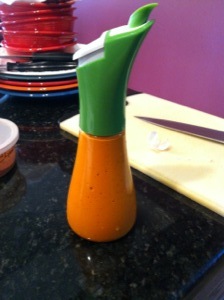 The experience of making this dressing is quite an easy one. 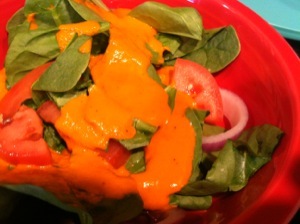 I typically purchase salad dressing but knew with my love of roasted peppers, I needed to make this one. 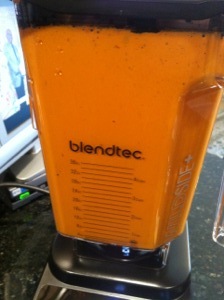 Put all of the ingredients into my Blendtec blender. 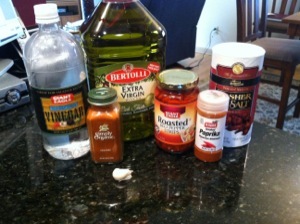 Bottled into the Zyless Shake and Pour salad dressing mixer. Note: To roast red peppers, preheat oven to high broil. Place peppers on baking sheet, and broil for 4–6 minutes or until blackened. Rotate peppers and broil again. Repeat this step until all sides of peppers are roasted. 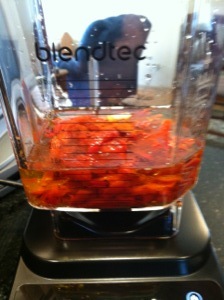 Remove peppers from oven, and place in covered container for 15 minutes to allow steam to loosen skin on peppers. Gently peel peppers and discard skin. Core and seed red peppers before use. Wow, that’s remarkable; I saw that show in L.A. as well! It was truly an unforgettable experience. 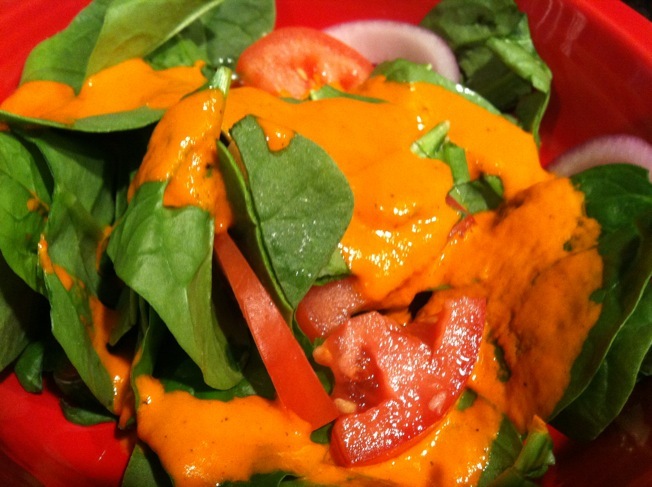 The salad dressing sounds great, too. I’ll have to try it. Food looks great! I’ll try it.